GOT FAQ's...? 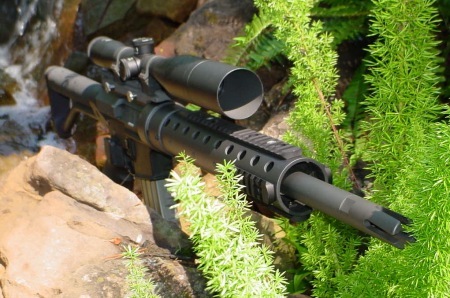 Click Here for the... 458 SOCOM FAQ Section! 250 grains to 600 grains (400-grain VLD bullets in bolt action rifles only). High velocity (> 2000 feet/second) as well as Subsonic/Suppressed. Semi-Automatic as well as Full-Automatic capability. Up to 15 round magazine capacity. The SinterFire ( www.sinterfire.com ) 300-grain frangible bullet in .458 caliber. These can be loaded in the .458 SOCOM for use as a subsonic close quarters/home defense round. The bullet disintegrates upon impact with hard surfaces such as interior walls, reducing the chance of injury to innocent bystanders. With more muzzle energy than the .45 ACP, this makes for an excellent choice for both law enforcement and the private individual. 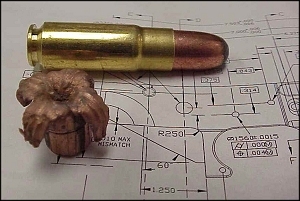 Load data for this bullet in the .458 SOCOM can be obtained from SinterFire directly. Field-testing of the cartridge shows that reliability with various loads using different projectiles is flawless and that the accuracy is outstanding. Velocity testing of the cartridge in a 24" barrel rifle using 300 grain bullets has shown velocities as high as 2,100 feet/second, rivaling modern high pressure loads in the venerable .45-70 as well as the 444 Marlin. Similarly, using 500 grain round nose bullets, muzzle velocities exceeding 1300 feet/second were measured, offering performance on par with 1-ounce slugs used in 2¾" shells for the 12 gauge shotgun. In addition, the use of heavy (500 to 600 grains) bullets, including specialized non-ricocheting frangible bullets, lends itself superbly to subsonic ammunition for suppressed applications. This picture shows a Barnes 300 gr. X Spitzer bullet recovered from the backstop after having been fired at 1,800 fps. The round shown in the background is a Hornady 500 gr. subsonic penetrator. By using the standard .223 caliber lower assembly and UNMODIFIED magazines, the .458 SOCOM Advanced Weapons System can be deployed simply by switching upper assemblies. The standard 30-round .223 caliber magazine will hold 10 rounds of .458 SOCOM ammunition, whereas the 20-round magazine will hold 7, and the USA 40-round version up to 15 rounds. As such, the .458 SOCOM Advanced Weapons System lends itself perfectly for law enforcement and special operations applications. carbon fiber hand guard, Lothar Walther barrel, SEI Vortex flash hider and IOR 6 x 42 tactical scope. Bad news for the bad guys. Tactical Entry Weapon with suppressor capability. Vehicle Disabling using solid and tungsten core projectiles. Animal control (including medium to large size game). Starline Bass, Midway USA and Graf & Sons now stock formed .458 SOCOM brass. Here you will find reloading documents for various 458 rounds. Upper assemblies for the AR-15 chambered in .458 SOCOM are available for purchase. Please refer to the "AR Uppers" page for more information or contact us directly at TeppoJutsu@peoplepc.com. Loaded ammunition is available through CorBon. Contact them at www.CorBon.com .